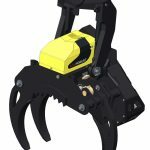 AFM 75 FH is a compact and cost-effective attachment for various forest operations. AFM 75 FH can be used in tree felling, cross cutting and even for loading. AFM 75 FH works efficiently on 20-30 tons tracked forest machines and excavators.